After a long offseason, SF State’s volleyball team looks to its small group of veterans to lead a large group of girls. Jazmine Williams, Jacquie Brice and Melissa Horton are the team’s only three seniors, and all have high expectations for the upcoming season. 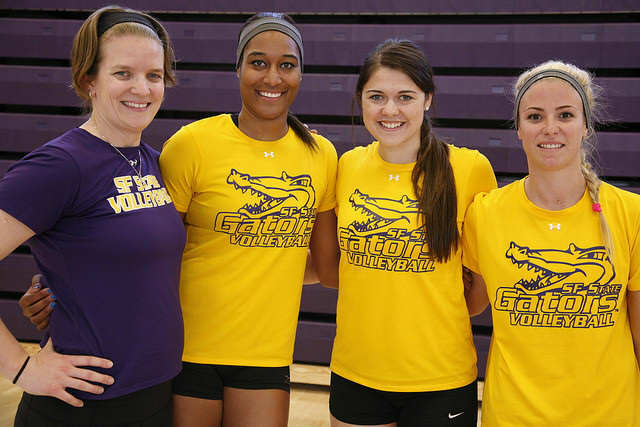 Coach Jill Muhe (left) and graduating seniors (left to right) Jazmine Williams, Melissa Horton and Jacquie Brice. Martin Bustamante / Xpress. They all bring experience, leadership and desire to a young team featuring ten freshmen and sophomores combined. According to Horton, this year’s goal is to make regionals and finish top three in the California Collegiate Athletic Association Conference. “I want to go out with a bang and play every match like it’s my last,” Horton said. Last year, the team suffered its worst season in five years, finishing under .500. Williams and Horton played for SF State in 2012 when the team cruised to a 21-9 record, only to be disappointed in the first round of the NCAA Regionals. Last year’s addition of Brice in gives the Gators an experienced setter who leads by example on and off the court. In their new roles, the three seniors embrace the responsibilities that come with being the veterans on the team. “We do a good job of holding each other accountable within our whole entire team showing our new players the culture of our gym and how things are run here,” Horton said. Jazmine Williams, who spent all four years on the Gator team, embraces the responsibilities and leadership roles that come with being a senior. “Even though its only three of us, it works because there are so many (freshman) that they can come and trust us,” she said. Second year coach Jill Muhe says the three seniors showed leadership, dedication and progress throughout their SF State careers, which got them where they are today. Brice said coach Muhe instilled a tough offseason conditioning program to get the team in shape. According to the seniors, the long hours paid off. “Our whole team worked hard in the offseason, and she had a pretty strict summer workout routine,” Brice said. Horton added that coach Muhe pushed the team hard in practice, no matter the conditions. For the three seniors, Muhe is the second coach of their collegiate careers. Muhe, a former college and professional volleyball player, knows what it’s like to go through a coaching change midway through her career. That experience as a player helps her relate to what it’s like being a player and what her team goes through everyday. Brice expects the team to advance further into regionals, and for the team to leave everything they have out on the court by seasons end. “I want to go back to regionals, get out of the first round and I want us to play like we have never played before,” she said. Muhe lives by the mantra of working hard, and always improving. She pushes her team to their limits, and gets the best out of them.